Information provided by the Independent Media Center in Guatemala (CMI-G). Several attacks were made against the Independent Media Center in Guatemala in the wake of the center’s coverage of a recent violent eviction in the department of Alta Verapaz. In a joint operation carried out by the police, military forces, and some civilians, more than 100 families were displaced, at least five community leaders were arrested, and three people were killed. These events — which occurred in an area where there are strong interests in hydroelectric, extractive, and agricultural mega-projects — have still not been properly investigated or resolved. Just after the eviction, CMI suffered attacks on its web page and server, which prohibited the immediate publication of information. Then, on August 23, a person who lives in the same house as one of the CMI reporters was kidnapped, harassed, and beaten. Direct threats were also made to the reporter who authored the columns about the eviction at Alta Verapaz. GHRC echoes CMI’s concerns that this attack represents a growing trend of criminalization and repression of independent journalists and communications professionals. 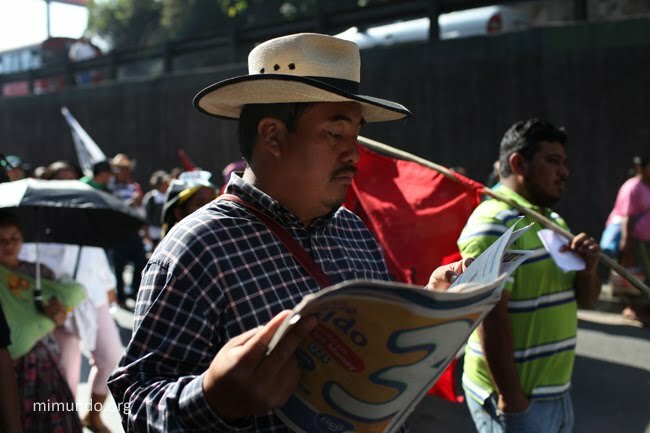 Others have been similarly targeted, such as Ricard Busquets from the Comite de Unidad Campesina (CUC), and Francisca Gómez Grijalva, a journalist who was threatened with trial for writing a column that critiqued industrial manufacturing company Cementos Progreso for abuse of power. CUC Coordinator Daniel Pascual at a march in 2012. Photo by James Rodríguez.